PORTLAND, Maine - A New York-based artist has become an unlikely source of revenue for a lot of Maine lobstermen. Internationally-renowned sculptor Orly Genger makes massive works of art using rope - particularly discarded lobster line. Tom Porter reports on New York artist Orly Genger's sculptures made out of discarded rope purchased from Maine fishermen. Genger's latest project is a monumental sculpture to be installed in South Korea next year, utilizing more than 3 million feet of rope. And to craft the piece, she's prepared to pay fishermen good money for outdated trap lines they don't have much use for. There's a saying back in England - "Money for old rope" - meaning to get payment for something which is seemingly worthless. Easy money, in other words. Well, that phrase is now a reality for many Maine lobstermen, thanks to the world of modern art. Laura Ludwig searches for rope to buy from Maine fishermen for New York artist Orly Genger. Down on Portland's working waterfront recently, Laura Ludwig slides open the back of her U-Haul. Ludwig - who used to work for the Maine Department of Marine Resources - was contracted last summer by New York artist Orly Genger to buy back 200,000 pounds of rope from New England fishermen, most of them Maine lobstermen. Inside the U-Haul truck is an example of Genger's art work - a 5-foot by 2-foot hand-crocheted section of a painted "rope blanket" is probably the best way to describe it. "I asked her to make a sample so I can show lobstermen as I collect their line and talk to them about it, the scale of her operations, she's a very small woman," Ludwig says. Tom Porter: "And let's see how heavy it is - My gosh, that's heavy." Laura Ludwig: "This is probably 80 pounds of rope right here." Nearby are two barrels of old rope, left there by lobstermen for Ludwig to inspect. The rope's probably around 5 to 7 years old, she guesses, and no longer good for fishing. "This line is very heavily chaffed," she says. "You can see that it's kind of fuzzy and might have some weak spots that you can actually see in it. And because it is in direct contact with the ocean floor, it really does abrade quite readily. So they can't fish this anymore, but it's perfect for an artist." Ludwig has just spent several days traveling the Maine coast, paying 50 cents a pound for old lobster rope. This time around she's bought nearly 30,000 pounds of the stuff. 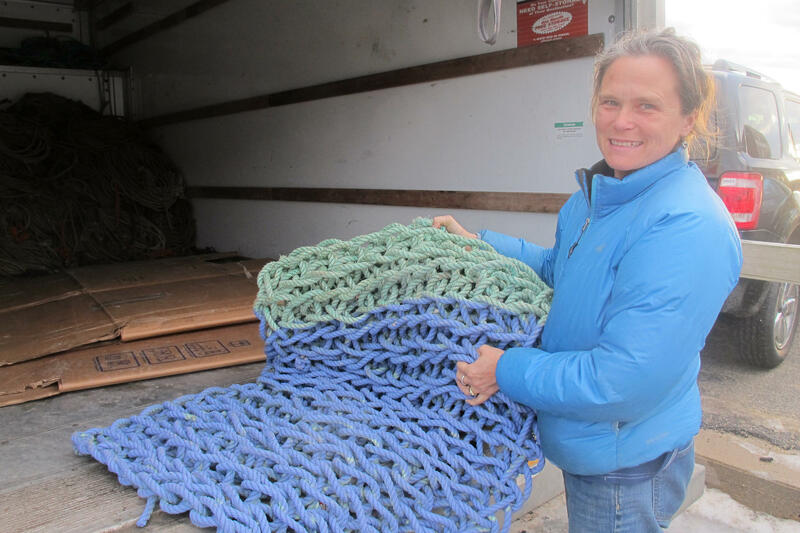 She says about 120,000 pounds of rope have now been collected from more than 200 lobstermen since the project was launched. Cape Elizabeth fisherman Tom Martin, who sold rope to artist Orly Genger. When completed, it will have put $100,000 back into the pockets of people like Tom Martin, of Cape Elizabeth, who just sold 1,000 pounds of old rope. "I mean, it's money we never thought we had coming," he says. "It's stuff that otherwise would be thrown away, and then there's money in your pocket to invest in new rope or traps or whatever you might want to put that money towards. It's very, very helpful." 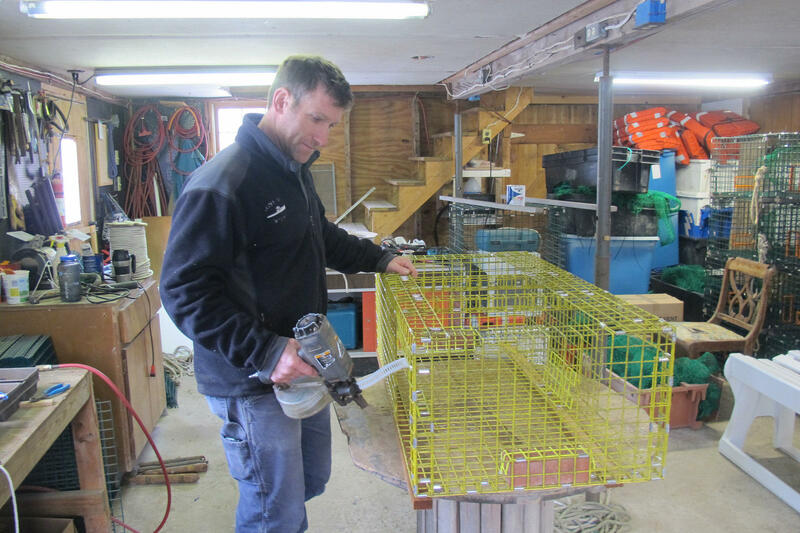 This isn't the first time Maine lobstermen have turned in old rope for other uses. When federal regulations were introduced in 2009 to outlaw the standard floating trap lines, as a way to protect against whale entanglements, a program was set up to let fishermen turn in their floating rope and get a voucher to buy new gear. The cast-offs were put to commercial use by a company in Waldoboro that made colorful doormats. But the lobstermen soon discovered that their new sinking rope, which spends more time on the rugged ocean bottom, wears out much more quickly. The result? A lot more used rope. For artist Orly Genger, this was a welcome opportunity - a case of waste not, want not. "The original draw was just the accessibility and the economics of it," she says. Genger used to work with climbing rope, she explains, but as her sculptures became bigger, this became too expensive. The availability at low cost of a large amount of recycled lobster rope provided a perfect solution. "It was an opportunity to get a tremendous amount of material within budget that worked for me," she says, "And then there was added extra bonus of actually recycling the material." Tom Porter: "So that fact that you're actually providing some kind of economic benefit to people as well is a driver." Orly Genger: "Yeah, economic benefit to them and to myself." Genger's been working with lobster rope for a few years now, and this latest work will be her largest and most labor-intensive yet when it's unveiled in Seoul next year - more than twice as big as anything else she's done. Many details of the privately-funded project are being kept under wraps, but Genger says the sculpture is being assembled piecemeal in her New York studio, where she and a couple of assistants are hand-knotting the rope and painting it. It will then be shipped over on pallets to South Korea, where the sculpture will be put together in its final form. "This idea of re-using a material for a purpose for which it was not originally intended in and of itself contains a beauty," she says. Genger needs to collect another 80,000 pounds of rope by September. But that shouldn't be a problem, says Cape Elizabeth lobsterman Tom Martin. "You know, we've probably got a thousand pounds, if she ever were to come back," Martin says. "It's easy for us to give it away, it's harder for them to create the art."